Over the past few years the pace of change has been picking up and many manufacturers have been turning to technology solutions more and more. With that said, many trends were identified for the electronics manufacturing industry in 2018 and beyond – from the IoT (Internet of Things), data driven intelligence and supply chain optimisation, to Industry 4.0 and automation. The first nine months of the year have passed and it has become more apparent that industry 4.0 and automation have been the leading trends so far. Industry 4.0 or smart manufacturing is where advanced manufacturing and information technology meet, and data is exchanged. Industry 4.0 includes cyber-physical systems, IoT, cloud computing and cognitive computing. It is all about connectivity and proactive integration. It is said that it can improve production processes, improve safety, better monitor, increase efficiency, collect data and provide an infrastructure secure enough to be used in security-sensitive industries. Many firms are embracing this approach and are developing their own IoT platforms and hardware. Trial runs are being performed in manufacturing firms and adjustments made as the process continues. Other firms develop platforms specific to client requirements and monitor them on a continued basis. Industry 4.0 has paved the way for new advancements in manufacturing technology and has moved automation and digitisation into a new era. Production processes have been revolutionised. Improved X-ray machines allow electronics manufacturing service (EMS) providers to ensure defects are detected beforehand, technical support can be provided to clients and quality, working products are released to the end user. New surface mount technology (SMT) equipment places components faster and more accurately. Selective soldering machines have also simplified the soldering process by closing the gap between hand and wave soldering, and lastly, newer version reflow machines ensure that profiles are accurate and more consistent. For electronics manufacturers automation is important, especially when it comes to quality and quantity. Not only does it improve efficiency in manufacturing facilities but it leads to an increase in productivity, reduces lead times and also leads to better quality products being provided to the end user. Automation allows for better control and consistency throughout the production process, and also allows for greater safety when it comes to employees - especially where they are exposed to hazardous and other dangerous elements. It is however important to keep your operational goals in mind when considering automation and even Industry 4.0. Optimisation of automation performance and the Industry 4.0 elements will need to be a top priority as this will influence productivity and efficiency. One will have to focus on monitoring the automation processes, diagnosing problems and resolving them to ensure optimal use of these platforms. In the end these trends will need to help you achieve your company’s goals in terms of reducing costs, increasing productivity, improving safety and expanding capabilities. Research will be key in determining the success of these trends when applied to your company, and also ensure that the correct automation processes and Industry 4.0 platforms are implemented. 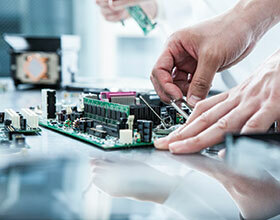 The electronics manufacturing industry is evolving at a rapid pace with more companies leaning towards the full outsourcing of their products to full turnkey manufacturing services. More strategic partnerships are being formed, user interfaces are getting smarter and the demand for high-quality products is increasing daily. Industry 4.0 and automation might just be what is needed for EMSs to remain competitive. We are quite intrigued to see what the remainder of 2018 will have in store for the electronics manufacturing industry and also what new trends and technological improvements will be unveiled, not only in terms of automation or Industry 4.0, but also new and unexplored fields.